Wikipedia describes recording sounds as “Sound recording and reproduction is a electrical or mechanical inscription and re-creation of sound waves.” (read more) While that sounds cool and all it really doesn’t help much we know. Looking to record sounds for personal use, commercial use, or just for fun? It’s really a cool hobby to have. If you are like me a sound means more than a photo. You know the old saying a picture is worth a thousand words? Well to me a high resolution sound recording is worth a thousand and one words. If you travel, or have kids, or go to a game, or other such things it’s always so amazing to record the audio and listen back on it a few months or years later. Its amazing really. Here check this recorded sound out. Yep that’s somebody peeing in the toilet, cool huh. I bet that’s not something you hear everyday. I mean it sounds like your head is in the toilet right? How cool is that! That was recorded with my Zoom 4 Handy Recorder a “handy” little device suggested to us by Bram. 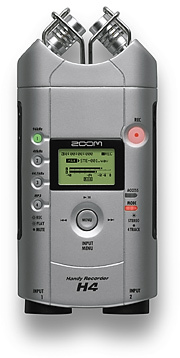 “The Zoom H4 Handy Digital Recorder fits in your palm and is ideal for recording live musical performances, interviews, podcasts, meetings, classes and seminars. The H4 allows you to record 24-bit/96 kHz digital audio as well as in MP3 format with bitrates up to 320kbps.” Samson Zoom 4 This little jewel is absolutely amazing, the quality of sound that comes out of this things superb. I mean the thing sells for around $200 that’s dirt cheap! It records to flash disc of which you can now get a 4GB for around $25 at just about any store selling them. Samson says “With a 16GB SD memory card, the H4 provides up to 24 hours of stereo WAV file recording in 44.1kHz/16-bit mode (CD Quality), or as many as 280 hours in MP3 stereo mode.” I’ve yet to find a 16GB card, but you get the point right? When you are done just plug your recorder into a mac or pc with the usb cable that came with it, then drag the files over to your computer just like you would drag across photos or word documents. If you do decide to get a Zoom 4 we suggest not loosing the little wind screen foam ball that comes with it, that thing is hard to keep up with. Well thanks for visiting SoundBible and reading this article. We hope you have fun in your ventures, and be sure to come back soon. This entry was tagged how to record sounds from your computer, pee in toilet, pee in toilet sound, record computer sounds, record music, record sound clips, record sound files, record wav by admin. Bookmark the permalink.